KING OF PRUSSIA, PA USA – Arkema Inc. introduces Kynar Rx® 752 polyvinylidene fluoride (PVDF) copolymer for use in minimally invasive medical catheters that are exposed to bodily fluids for less than 30 days. 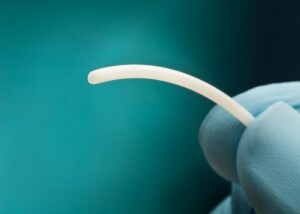 Kynar Rx® 752 copolymer exhibits exceptional flexibility, very low friction, and can be melt extruded in single or multi-layers for catheter shafts and other performance medical tubing. Fluoropolymers are commonly used in catheter constructions that require excellent flexibility and low friction. However some fluoropolymers, such as polytetrafluoroethylene (PTFE), are not easily melt processible and require manual assembly of components to create multilayer catheter shafts. The Kynar Rx 752 fluoropolymer was specifically developed for medical catheter applications and is readily melt processed using standard extrusion or injection molding equipment similar to those used to process polyethylene (PE), polyvinylidene chloride (PVC) or polypropylene (PP). This allows for continuous coextrusion of multilayer constructions used in advanced catheter shaft designs. Additionally, Kynar Rx copolymer tubes and molded components can be welded together using radio frequency (RF), direct heat contact, and ultrasonic methods to create consolidated catheter components. Kynar Rx 752 copolymer is USP Class VI compliant and exhibits outstanding resistance to chemicals and temperatures. This allows medical device components made from the material to be chemical, autoclave or irradiation sterilized. The material offers a flexural modulus of 50,000 psi (345 MPa) and dynamic coefficient of friction of 0.54, according to ASTM test methods. Kynar PVDF fluoropolymers have been a material of choice in many industries for flexible, low friction, and environmentally resistant tubing. Arkema’s new Kynar Rx 752 medical grade copolymer can be coextruded into multilayer tubing, providing device companies with an alternative to manually assembled shafts with PTFE liners.For more information about Arkema’s Kynar Rx 752, please visit www.kynar.com.